The Harlingen Irrigation District covers 56,114 acres within Cameron County and holds a Certificate of Adjudication for 39,574 acres of “Class A” irrigation water rights. The main pumping plant diverts water from the Rio Grande near the town of Los Indios. The facility was built in the 1920’s and has a current operating capacity of 470 cfs with a typical peak-pumping rate of 410 cfs. The district has 57 miles of main canal, over 200 miles of irrigation pipeline, 44 re-lift pumping stations, and three storage reservoirs totalling a volume of 1,380 acre-feet. Harlingen Irrigation District Cameron County No. 1 (HIDCC1 or the “District”) was established on May 13, 1914 by the Cameron County Commissioner’s Court. The District headquarters are centrally located in downtown Harlingen, Texas. HIDCC1 provides drainage, flood control and water supply services to 88.3 square miles of Cameron County. The total irrigated area within the District boundaries is approximately 38,000 acres. 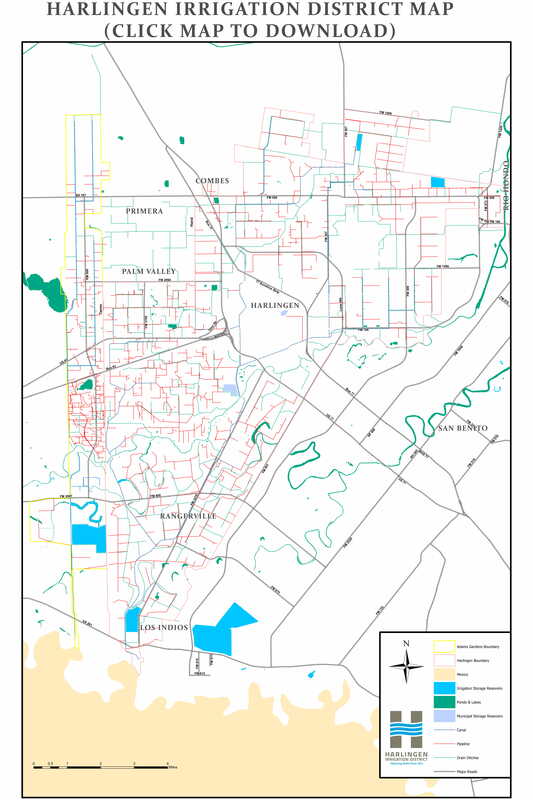 The District is located within the boundaries of the Texas Water Development Board’s Rio Grande Regional Water Planning Group (Region M) and includes portions of the cities of Harlingen, Palm Valley, Rangerville, Primera, Combs and Los Indios. The Rio Grande serves as the only water source for HIDCC1’s water supply system. All of the water diverted by the District from the Rio Grande, originates as surface water released by the International Boundary and Water Commission from Falcon Reservoir. The District’s primary pumping plant is located approximately 10 miles south of Harlingen. The District extends northward approximately 8 miles north of Harlingen. The District is about 1 mile wide at the south end and 13 miles wide at the north end. The District water supply system consists of 40 miles of earthen canal, 17 miles of lined canal and 200 miles of pipeline. The system also contains 25 check structures and 44 pump sites. HIDCC1 operates three reservoirs including the CCWC No. 1 Reservoir, located in the south end of the District, and the McLeod-Hood Reservoir and Bogus Lake, both located in the north end of the District. The reservoirs are used as a buffer for absorbing changes in daily producer uses as well as equalization mitigating the four-day travel time of water from Falcon Reservoir. The Harlingen Irrigation District Cameron County No. 1 “Class A” irrigation water right is 98,232 acre-feet per year. Since this water right is provided “as-available”, the actual amount of water released from the Falcon Reservoir on the District’s behalf varies from year to year. HIDCC1 also holds municipal water rights of 992 acre-feet per year and is authorized to divert 22,188 acre-feet per year for municipal water used by the City of Harlingen. The District’s average annual water diversion is 52,000 acre-feet per year for irrigation and 15,000 acre-feet per year for municipal and domestic use. The District reports the estimated water delivery efficiency in the 85% range. Irrigation Districts are restrained from borrowing money for more than 3 years without referendum. Harlingen Waterworks, CCDD#5, Adams Garden I D, Palm Valley and the City of Harlingen. The maximum assessment rate by law is 67%. The District currently assesses at a rate of less than 15% of budget. The current District flat rate assessment is $24.00 for the first acre and $14.00 for subsequent acres on each account. The District is not currently nor does it appear to have potential for litigation. The District has an agreement with Adams Garden Irrigation District to operate that District within the boundaries of the income of said District. The District provides water to the City of Harlingen on an “as needed” basis. Approximately 80% of the irrigated lands served by the District have been laser-leveled. Typical slopes in the region vary from 0.05 to 0.10 of a foot per hundred feet. The District contains 3309 irrigation accounts and 900 non-agricultural accounts, which include water for lawns, golf courses, parks and school grounds. The District maintains 25 automated checks that hold stabilized water at useable levels for the land behind the checks. The District pumps water from the Rio Grande and disperses these waters into the canal system at an elevation of approximately 58 feet above sea level. The end of the system is approximately 24 feet above sea level. There are 44 pump sites that charge pipelines off the main channel of canals. There are gate systems at each pump site, as well as field gates or turnouts on every field or parcel. In some cases, there are more than 1 gate or turnout per parcel, depending on the size of the parcel. The majority of the District is irrigated by furrow irrigation through polypipe field distribution systems. There are also some drip and/or micro-jet systems as well as some overhead sprinkler operations on turf farms. The District maintains the Center for Ag Water Efficiency located next to the river pumping plant. This is a state of the art facility designed for training district personnel and growers in the latest technologies available for water conservation. This facility is also used for calibration and testing of irrigation flow meters. The center contains a classroom with the ability to seat 25-30 students and is available to the public for conservation and water related functions.